Totally free! Custom shard Dedicated server. Enjoy the Tartarus facet, 3 new dungeons, new craft capabilities, over 200 artifacts upgradable and craft-able, custom quests and much more to discover! 325 Stat Cap 1200 Skill Cap, 6 characters and 3 houses per account. See Full Detail on UOT Website! 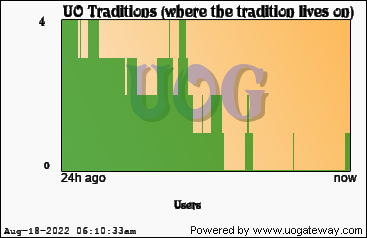 Stats last updated 237 seconds(s) ago using 256705 data samples.